A tall, majestic set of stairs can be the showpiece of your front room. However, the area underneath can remain an eyesore if you fail to utilize it properly. These ideas can help you create a unique, artistic, and usable space under your stairs. These ideas are relatively easy to carry out and help add value and style to your home. If the area under your stairs is quite spacious and generous, you may have enough square footage to create a small powder room. A powder room is sometimes referred to as a half-bath. You can install a sink and a toilet under the stairs. You can then cordon your powder room by putting up two walls and a door. If the area under your stairs is not quite roomy enough for a powder room, you can still make the most of it by creating a set of bookshelves in this space. You can start the set of shelves all the way at the top of the ceiling or at a height that suits your purpose. You can also extend it to reach the entire length of the stairs or keep it as narrow as you prefer. You will have a bookshelf that is easy to get to and one that adds character to your living room. Keeping your bicycles outside is ill-advised if you want to keep them safe and in your possession. Rather than leave them outdoors where they can be stolen, you can instead keep them inside your living room by hanging them upside down under the stairs. Creating a bike storage rack is as simple as attaching a couple of sturdy hooks or hangers under the stairwell. You will then have a place to keep your bike inside when you are not using it. If your stairwell is close to the kitchen, you may find the appeal in creating a pantry under the set of stairs. Creating a pantry can be as simple as installing a set of shelves in this space. You also may decide to attach pantry doors to keep your kitchen and dining room goods out of sight. This idea may appeal to you if you plan to store your broom and mop in your understairs pantry. You can also set up a set of racking to use as a wine rack for your home. This idea can have merit if the stairwell is close to the dining room or kitchen. You may do well to make sure that the understairs area is not carpeted in case of accidental bottle breaks or spills. You could re-floor this area with tile or vinyl. When you work from home or you and your family conduct quite a bit of work on the computer, you may be in need of a home office. The area under your stairs could be spacious enough to set up a small office for your home. You can place your desk and computer under the stairs. You likewise could place your file cabinet and other office furnishings in this space. You could even hang a cork board on the wall under the stairwell. The underpart of your stairs often provides the ideal area to place your home's entertainment center. You can also create a home entertainment center by setting up shelves or placing tables under the stairwell for the TV, stereo, speakers, gaming system, and other fixtures. The area under your stairs can be ideal to use for a variety of purposes. 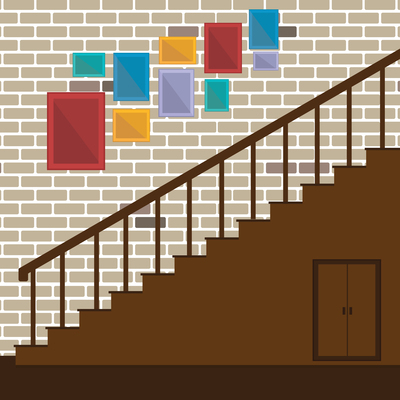 These tips can help you make the most of your home's understairs area.